Even beginners to the workout world have heard about HIIT, high intensity interval training. However, you may be wondering how to incorporate HIIT into your daily home workout routine. 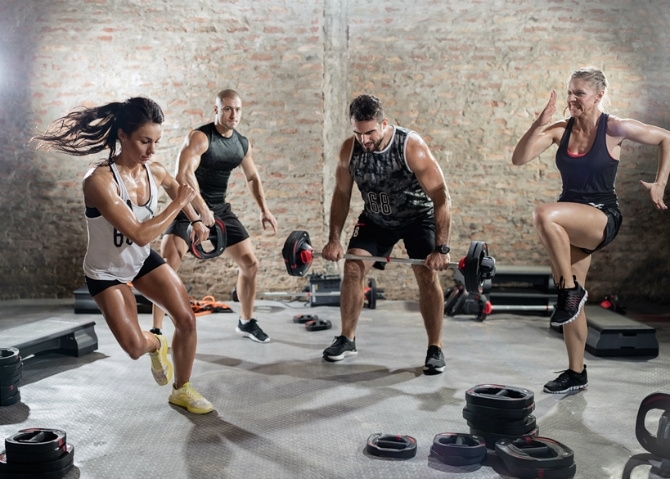 For experienced physical trainers, HIIT workouts are likely a foundational part of your time with your clients, but you may be wondering how your program can be more successful in a home gym environment. Here are just a few considerations to keep in mind, no matter your fitness level or experience, to assure that your HIIT workouts are safe and successful. No matter if you are new to HIIT as a part of your workout or if you are experienced, it is always crucial to go into your time with a plan. Having a plan for your intervals will keep you motivated during your sweat time, and will reduce the temptation to pick an easier exercise in the middle of your exhaustion. Keep your HIIT sessions short and sweet, remembering that your chances of injury can increase if your time goes over 30 minutes. HIIT sessions can be as short as 4 minutes, like Tabata, or can go as long as 12 to 20 minutes. In any case, your exercises should be a balance of cardio bursts and strength building. Each interval should last between 10 seconds and 30 seconds, alternating between high level intensity and a slower active recovery. If you aren’t sure how to put together a fun and safe HIIT workout, consider downloading an app that gives you the exercises and times your intervals. You can also put some exercises in a bowl and draw out your interval exercises right before you begin. In any case, having your plan before you start your first interval will keep you burning the calories and having fun. For most people, HIIT workouts require minimal equipment, making them ideal for beginners or novice exercisers who prefer to workout at home. A few weights and a pair of good shoes will keep most HIIT enthusiasts moving and burning fat without taking up too much space at home. However, if you are ready to increase your HIIT game at home, consider purchasing a treadmill. You can incorporate sprints as well as recovery jogs into your HIIT routine by simply adding a treadmill to your workout space. Treadmills complement HIIT workouts well and allow you to increase your cardio activity to meet and exceed your fat burning goals. Fortunately, you don’t need to spend lots of money on a new treadmill to get maximum results. Preowned treadmills are a wonderful alternative that give you a safe experience at a fraction of the cost. If you are ready to up your HIIT game, stop by to browse our selection of treadmills and strength equipment. Make this the month you get serious about improving your HIIT workouts. We’ll see you soon!